Explore vertices and diagonals while seeking patterns in polygons! 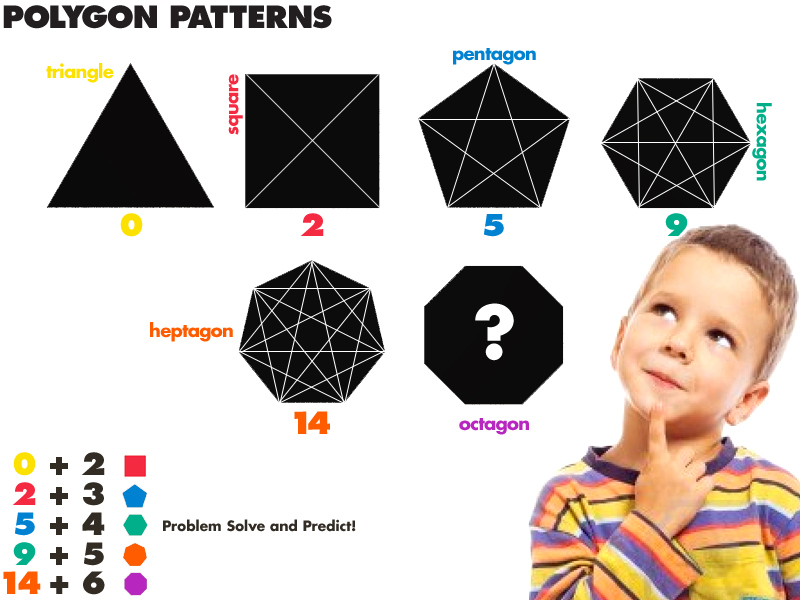 Have kids predict the number of diagonals a triangle, square, pentagon, hexagon, heptagon, and octagon have. Split kids up into teams. Then, have them problem solve by drawing diagonals on shape outlines. Make sure kids use different colored markers for each diagonal (so they can count them). Also, have a teammate tally each diagonal drawn. Can they find a pattern?! How many diagonals does a hexadecagon have?! thanks for this - perfect for where I need to take my kids next. Perfect for exploring patterns!